Family law issues in particular often involve personal differences and problems that are less frequently encountered in other areas of the law. This means that you will need a family law specialist on your side who is both sensitive and assertive. We will assist you with all kinds of family law questions in our offices in Aachen, Cologne and Düsseldorf. Take advantage of our offer today and request a free preliminary assessment by e-mail or telephone. The diverse area of family law is very much characterised by its interpersonal nature. For this reason, our general approach in all cases is first to find an amicable solution for the parties, out of court. In particular considering the welfare of any children involved, it is imperative that marriages should be dissolved as amicably, and at as low a cost, as possible. Settlements out of court of family law disputes are faster, more efficient and more cost-effective than court proceedings. If, however, an amicable solution is not possible, we will represent you in court, too, using all of our practical experience to assert your interests. The German family law is hardly comprehensible for foreigners, therefore a reliable partner is indispensable for family law questions. Comprehensive and personal support in difficult times. 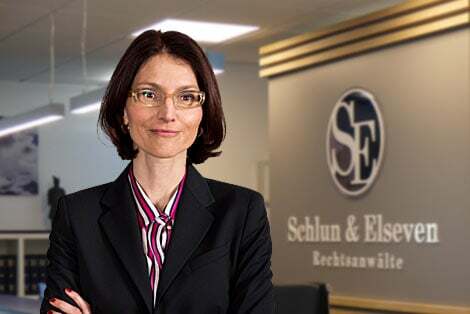 Schlun & Elseven Lawyers will be assertive and forceful in representing you and your interests in Germany. In this section, you will find a brief overview of different family law issues. If you like, you can obtain further information on every topic. If you already have a concrete issue, are under time pressure, or simply have a question, you can contact us anytime. We will give you a non-binding preliminary assessment tailored to your individual case. If you are considering separating from your partner, the issue of money in this context is often of particular importance for your financial future. There is a difference between alimony and child support. Our Specialist Lawyer for Family Law, Ms Nicole Kania, will tell you what you need to do in order to assert your right to maintenance payments. The decision to separate or divorce is often a hard one. However, there are some things that must be done in this psychologically very difficult time to make the process as simple and smooth as possible. Our lawyers will explain the preparation for, as well as the process and consequences of a divorce. In the event of a divorce, all pension entitlements of both spouses acquired in the marriage will be shared equally between both parties. This applies to pension claims with the German pension insurance (Deutsche Rentenversicherung DRV) as well as for company and private pension claims. Custody is both the right and the duty to act as a child’s caretaker. There are two types of custody – joint and sole. The latter applies where one parent voluntarily surrenders custody. We are happy to explain you more about these points, as well as residence rights. After parents have separated, this usually means that their child, too, is separated from one of them. However, a child has the right to contact with both parents. This only becomes relevant if the parents are living separately. There are two models here, the residence model and the switch model. In the end, the decision rests in the hands of the family court. Proceedings under the Protection Against Violence Act constitute a preventative measure aimed at protecting a party from violence and stalking. We will tell you how to protect yourself, what requirements there are, when the protection becomes effective, and what will happen in the case of non-compliance with the injunction. If you are in need of immediate help, call us! Use our online-form to tell us about your concern regarding Family Law in Germany. After receiving your request, we will make a short preliminary assessment on the basis of the information provided and give you a cost estimation. You are then free to decide whether you want to instruct us. We can guarantee that this service is non-committal and free of charge.